» What Are The Best Shoes For Jumping Rope? What are the Best Deadlift Shoes for Powerlifting and Bodybuilding? What's up fitness freaks, I'm Ruaan. I don't spend 10 hours a day in the gym but I hate missing a leg day. The goal of this blog: to help you to overcome difficulty and frustration during the journey of getting fit. All the exercises, guidance and recommendation are well-conducted from experts' advice as well as from my personal workout experiences. My wish is to make fitnesspurity.com the most fulfilling and easy-to-follow fitness blog on the interwebs! What Are The Best Shoes For Jumping Rope? ​"Some shoes can also be for running, some are not. Some are comfortable but some aren't as they meant to be. After executing proper jumping rope techniques with various pairs of shoes, we've found that the Nike Men's Air Monarch IV (4E) Training Shoes is the best shoes for jumping rope." 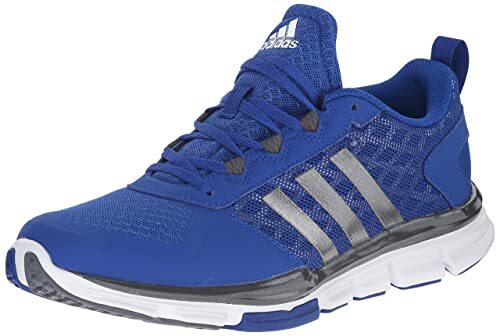 If you are looking for shoes with aerobic support, which means light-weight and extra padding and more balance and support, the Adidas Performance Men's Speed Trainer 2 Training Shoe is the right one for you. For Reebok Men's R Crossfit Nano 5 Training Sho﻿﻿﻿e, it’s more about being long-lasting. 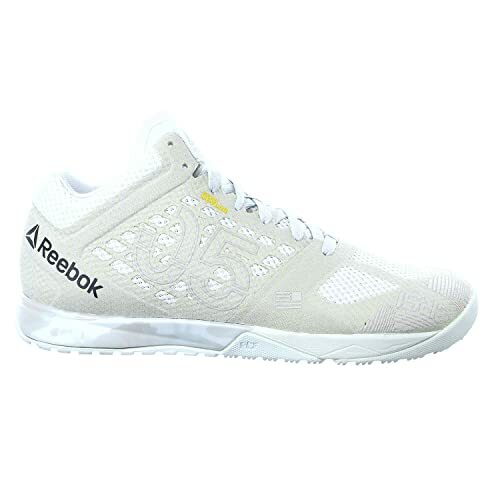 If you want to find a light shoe but is still highly flexible to use in your workout sessions or just jumping rope around, Reebok no doubt would be what you need. For people who do light workouts and on easy floor surfaces, the Xero Shoes Prio Training Shoe should be the right one for you. Individuals who do on-the-spot exercises will greatly benefit from it. The New Balance Men's MX608V4 Training Shoe is a good shoe for indoors or light exercises. Jumping ropes can still be done using these shoe line. However, if you want to change and further improve your jumping regimen, you’ll need other shoes for it. 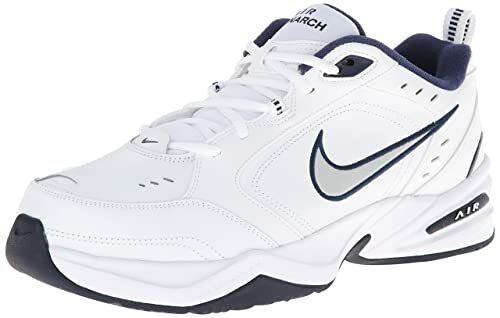 And last but not least, the Nike Men's Air Monarch IV (4E) Training Shoe is for people who wanted a comfortable shoe that delivers real shock-absorbent feats and arch support. It is a combination of everything you need to look for in a pair of shoes for jumping and running: longevity, balance, support, extra padding. What're The Right Shoes For You? You have everyday shoes and business footwear including shoes for exercising. You’ll be surprised to hear that there are specific shoes created for walking or jumping as well. If you choose the wrong footwear, chances are you’ll end up hurting your ankles and feet. You have to know the best shoes for jumping rope and which ones are right for you. Separate home, office and workout shoes - Everyday shoes will seem a bit stiffer when you exercise with it, while home shoes are a bit soft for the workout. Business shoes are heavy, while trekking in the great outdoors are even heavier if you have steel-toe boots. Know your feet - Should you buy exercise shoes that are really about your size or a bit loose down there for natural movement? Some users have felt pain during workouts because the shoes are too tight. Let it have some room so that your toes can still wriggle and keep you in balance. Stability - Because you’ll be jumping for minutes, you’ll be using the balls of your feet a lot. Your heels don’t get to touch the ground unless you’re done with the training. So, you need a shoe that can help support and balance you. Motion control shoes - By which we mean there is greater support for the arch since heels will be up in the air for some time. Up, down, up, down. You will be tip-toeing for a while, and your arch will hurt. You need shoes to move at ease with you, and not be a burden while exercising. Examine the soles of the shoes - If you’re jumping on a hard surface, you’re sure to hurt your feet. The soles provide cushioning for a safe, painless landing. However, too much cushion will give you a hard time to jump. Durable through the years - If you’re a beginner, you won’t be exerting much on your shoes. However, if you’re a veteran or just someone to upgrade his or her jump rope regimen, you need to buy shoes which will carry out for a year or so. Light or heavy weight - If the shoes are light, it’ll give you more freedom to jump more. A stout footwear will only constrict you from jump rope. Here’s an infographic image you can keep when looking for the right shoe. Which Shoes Are For You? The American Council on Exercise said that the best shoes for jumping rope must have a well-protected toe line and offer a lot of padding for the balls of your feet. Below are what they have recommended. Aerobic Support - Aerobic shoes are typically lighter but still offer comfort and support to your foot. See if the shoe you have is for a reinforced toe line and comes with extra padding. The padding helps grip for the impact. Try your shoe before buying it. Jump around and feel if the shoe has enough padding or is comfortable enough for you. Cross Trainers - These shoes are built for heavy-duty and offer a flexibility of usage for the various exercises you’ll be doing. They last longer for high-intensity workouts. Cross trainers are sturdy to keep your toes alright and support your arch when you jump a lot. Before Buying Shoes, Execute Proper Jump Rope Techniques. Your kicks help control your movements and protect you from any abrasiveness of the floor. The straining of your ankles and arch will lessen with the proper footwear. However, before buying your new shoe, p﻿﻿ractice better jum﻿p ski﻿lls. The wrong way of jumping can impede how your workout gear protects you. Jump with your toes and land on the balls - Since you’ll be jumping for quite a time, you’ll be using your little toes for support. Try to avoid landing on your heels - It’ll create a greater strain when you roll your feet to jumping position again. Your shoe, at this point, will support your motions and arch. Correct rope length - Not having the proper length of the rope will make you trip and fall. Thus, further injuring yourself. To know the proper size of the rope, you have to bisect it with your feet. Step on it and bring your hands to your sternum. A bit shorter or longer can affect your jumping. Follow a rhythm, your jumping has a beat - Don’t jump if you feel like lost to it. Besides, jumping to a rhythm makes the workout more fun. At least it’ll give you the motivation to push for that last set. Here, we have gathered the best shoes for jumping rope from users who has experienced it for themselves. The product is made from textile and comes with a rubber sole. It is lightweight and design with a padded tongue. It is surely durable outsole with traction control. Durable. Users have reported having it used for more than a year one. The shoes also were used for different workout regimens, and it wasn’t that worn out. Good for heavy workouts too. For people who do a lot of high-intensity training, the shoe can give them stability and support. Snugs so well at the bridge of the foot. The foot doesn’t slide or turn inside the shoe. The shoe is too narrow. Users have a hard time fitting the shoes and clamors that it’s not okay for people with wide feet. Users report that shoelaces were somewhat damaged and torn upon arrival. Features of the shoe were revealed coming apart on the front after only a couple of weeks. Too stiff and too slim. Users even get blisters from wearing them because it is wrapped up too much to their feet. Or could be that new shoe issue. Little to no air flowing. Your feet can get sweaty. The shoes may be nicely built, but there’s not any air flowing inside. Users have a hard time wearing them during summer. If you’re someone who’s looking for a shoe that screams balance and support, this could be it; though it might help if your feet are a bit narrow. It’s one the most things people comment on. They were created to protect midsole abrasions and give support to your feet. They infiltrated mesh-ups for airflow and durability of the shoe. It has raised outsole lug patterns for better floor contact and improved traction. It is made of carbon rubber to withstand demanding workout regimen. Comfortable. They shoes are wide. Some people have discomfort for bending, though. But they are safe for usage. Lack of cushion still makes up for footfall. One user explained he was aware of how hard or soft his foot hits the ground when he walks. It helped him with his knee problem. Very versatile. It’s comfortable and great for lateral and rotational footwork related training. Heavy duty. Not only is it good for running, but for outdoor activities, it can hold great as well. Shoes are light yet offer stability for workouts. Deadlifts, squats, box jumps, burpees, GHD, Snatches, thrusters, all of these movements and more these shoes rock at. Aesthetically not pleasant. Improving its design would be better said one Reebok user. Uncomfortable like and old sock since it's very thick. Slapping sound when it comes to running. It’s not a squeaking sound either. Since materials are hard for heavy duty, it’ll take some time to be comfortable with creases on the top when walking. After a good beating with it, though, your feet will be just fine. This is what is meant by long-lasting. If you want to a light shoe but is still highly flexible to use in your workout sessions or just jumping rope around, this might be the one for you. Another Crossfit shoe, it has a rubber sole and a foot-first design which leaves wide toe boxes that let your toes spread and relax. Zero-drop, non-elevated sole for proper posture while participating in road running, trail running, fitness, Crossfit, hiking, etc. Minimalist. Minimalist shoes let you feel your feet, and entire body adapt to the material to handle its features. Flexibility. These are low-to-the-ground for balance and agility. The flexible sole lets your feet bend and move naturally. Good for jump rope activities. If it requires you on light, smooth flooring to jump rope, there will be no problems with it. And you can push yourself for another set of jumps. Comfortable. Users say it’s close to even being barefooted. For a light shoe, it offers balance and coordination. It keeps your feet stable, especially for a rigorous workout jump. Materials on the upper part of the shoes make people sweaty. Less air goes through the upper part of the material. This can be understandable for thick and heavy shoes, but the Prio is super light with thin materials. Uncomfortable in the heel, and hard step-in. Jumping rope is still considered as a HIT workout despite looking like a kid’s game, so you’ll be needing something slightly thicker and with a stronger sole and a thick upper material to protect your toes. For people who do light workouts and on easy floor surfaces, the Vibram might be the right shoe for you. Individuals who do on-the-spot exercises will greatly benefit from it. 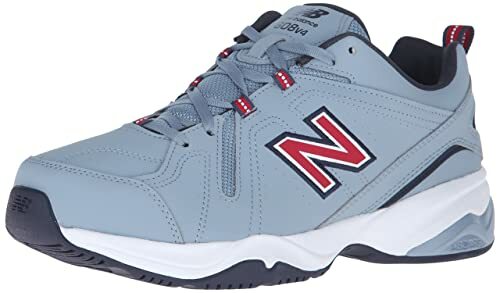 New Balance boasts of a dual-density collar to use as both for softer density foam in contrast to the foot for cushioning, and steadier density foam for support. Keeps you up on your feet all day. If you’re just jumping regularly, it can help you for a while. Shock-absorber. The shoes absorb the shock if you’re working out on a hard floor. They come in wide sizes. Most people claimed that a lot of jump shoes are too narrow for their foot. New Balance, however, made the extra width available for people. Suitable for light exercises. When wearing New Balance, it seemed like it just can carry you for light exercises. So, jumping rope would naturally come off pretty well. Good fit. Also, in addition to the wide sizes, this one stays true when it says what size it is in. Arch support is only fair. You can slide and strain your feet if you keep jumping for so long. Insoles are uneven. It will make you uncomfortable even when just walking. Quality is not that good. Soles are coming off, sides are not tied well, and stitching comes off, all for a brief time. Flimsy. You can wobble if you keep on doing jumps or other tip-toeing activities. Stability is just a little above average. It’s thin. The material will quickly wear out due to its quality. New Balance is a good shoe for indoors or light exercises. Jumping ropes can still be done using these shoe line. However, if you want to change and further improve your jumping regimen, you’ll need other shoes for it. Typically a running shoe, Nike still provides the same aspects in protecting the ankles and pronation of the foot. The ankles needed support when rolling to a tiptoe position. Shoes fit and are wide. While some shoes are too narrow and a bit small in size than what they have published, Nike stayed right. Also, it can give you enough room for your toes to wriggle. It is also wide to give you air. Comfortable to wear. The sole provides excellent cushioning. It’s neither thin nor thick enough to bother you when you’re doing your workout. Great arch support. Whether people have low or high arches, Nike still supports your foot moves. Sturdy and good for protection. The toe line is strong to support you when you’re jumping. Material upgrades are of excellent quality. Expect this shoe to lasts for some time. It’s squeaking. The number one issue users have the squeaking sound it gives. But that can be easily remedied with pulling out the inner sole. It looks bulky for your feet. It looks large and adds that extra size to your feet. Flexibility is just above average. At times wearing them is a bit stiff. It’s hard to move at first, but give it a few beating; it’ll work fine. The seam of the shoe. It annoys some users as it can cause blisters if worn too much. It has heavy padding as well. It’s awkward and uncomfortable even though this feature is the one that protects your from injury and can give you stability. For people who wanted a comfortable shoe that delivers real shock-absorbent feats and arch support, Nike has this shoe to offer you. Between Reeboks and Nike, it was a very hard decision. But in the end, we chose Nike Men's Air Mo﻿narch IV (4E) Training Shoe as one of the best shoes for jumping rope. Even though Nike has issues, these shoes can still be adjusted. Most people claimed that the number one problem they have with shoes is the tight fitting. But Nike offers them wide for different people and provides arch support for individuals who have various arch types. It’s good for people who are starting out of their jump rope regimen and still gives that quality support for those who wanted to do more. Do Pull Ups Help Increase Height? 3 Tips That Can Help You! Pull Ups Vs Chin Ups – What Muscles Do They Work? FitnessPurity.com is a participant in the Amazon Services LLC Associates Program, an affiliate advertising program designed to provide a means for sites to earn advertising fees by advertising and linking to Amazon and the Amazon logo are trademarks of Amazon.com, Inc., or its affiliates. Copyright© 2019 by Fitness Purity.